The Golden State Warriors comfortably won Game 1 of their against the Portland Trail Blazers on Sunday. There was a controversy brewing after the game because of some things that happened at the Oracle Arena, home of the Warriors. The Warriors threw confetti after winning Game 1 of the first round of the playoffs…. The Warriors have made the NBA Finals for the past two seasons, and will most likely make it there again this year. With that being said, should we have different expectations for different teams in the playoffs. If the Houston Rockets did the same thing last night, it would be understandable because the Rockets have not had many playoff wins in the past two decades. What bothers me is, that the Warriors are basically just showing everyone how good things are for them, which should not be a problem. I think it is perfectly OK for teams to treat every playoff game with the same mentality whether it be Win #1 or #16. Maybe it is just the Knicks and Jets fan in me, (Mehtaphorical difference, did it again) but I love when teams have playoff traditions. The Rangers have a tradition where they save a puck from each win, hoping to save 16 pucks in the end. 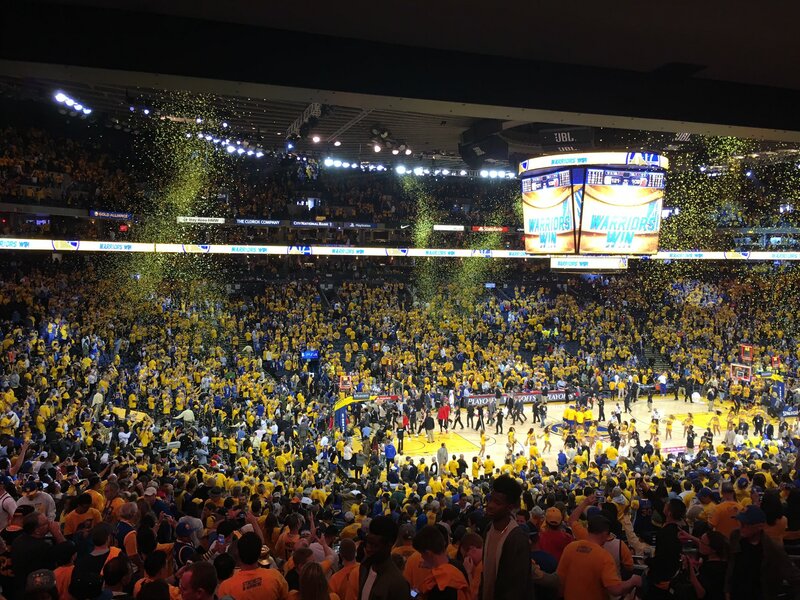 The confetti dropped at the Warriors game was not excessive, in fact it was appropriate for Game 1 of the first round of the playoffs. People continue to have the “get off my lawn” or “act like you have been there mentality”, but times have changed and it is OK for teams to celebrate playoff wins. Last season did not end great for the Warriors in the NBA Finals, maybe the confetti was supposed to symbolize them breaking their 3 game losing streak. The confetti might just been there from last year’s Finals but never actually fell down. As someone whose teams rarely make the playoffs, let alone win once they get there, I have no problem with teams celebrating every playoff win, like they have just won the whole thing. The NBA playoffs are in full swing, so follow along on the old Social Media for some live reaction of the games, from the perspective of a depressed Knicks Fan. Remember to hit that Like and Follow buttons.